Police badges and handcuffs are often an overlooked item when it comes to planning storage at a law enforcement office – after all, how hard can it be to store something that only takes up a few inches of space? But in reality, badges, handcuffs and tasers are easy pieces of equipment to lose or misplace. If a badge is lost it can pose a potential impersonation risk but can also be expensive to replace. Plus, with multiple types of badges for promotions and replacements, there’s more to store than you might realize. Handcuffs are so standard at law enforcement agencies that they’re easily overlooked when it comes to storage. Although they’re typically issued to each officer, there are still spare handcuffs around that need to be stored and secured – after all, though they’re small, they’re often expensive and always needed. Most police and sheriff’s departments have a protocol regarding how personnel should store their Tasers or other electroshock weapons while off-duty (typically in a locker room), but many agencies have no specific guideline or solution for storing spare electrical control devices and extra cartridges. Why would you should consider a Public Safety Equipment Solution? 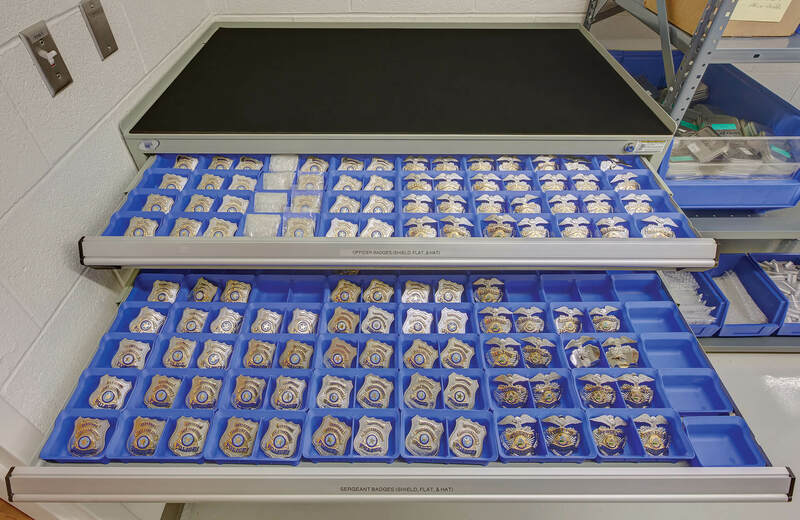 The best system for badge storage consists of 3 parts that can easily be integrated into your department’s overall gear storage solution. The first line of defense against avoid stolen and misplaced badges is a locked room. Chances are, your department already has a room for storing extra gear and uniforms that can be locked, but if not, it’s worth investing in for the peace of mind. 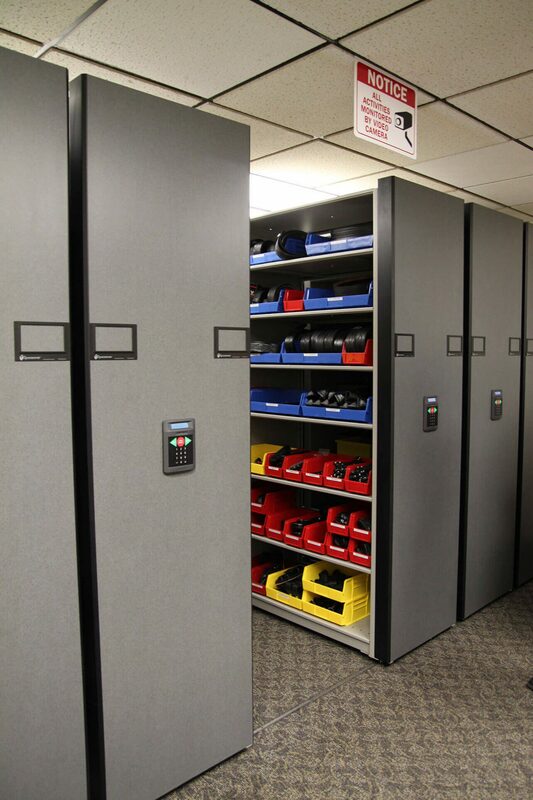 Within the locked room, a 4-post shelf with a locking drawer keeps badges secured, in one location, and protected from being damaged by surrounding gear. Within the drawer, bins or dividers can be used to separate different types of badges. Alternatively, if you use a lockable mobile storage system (see mobile storage option), you can simply use plastic bin dividers on a shelf to organize different types of badges (but beware of using this method if you aren’t using a locked shelf). 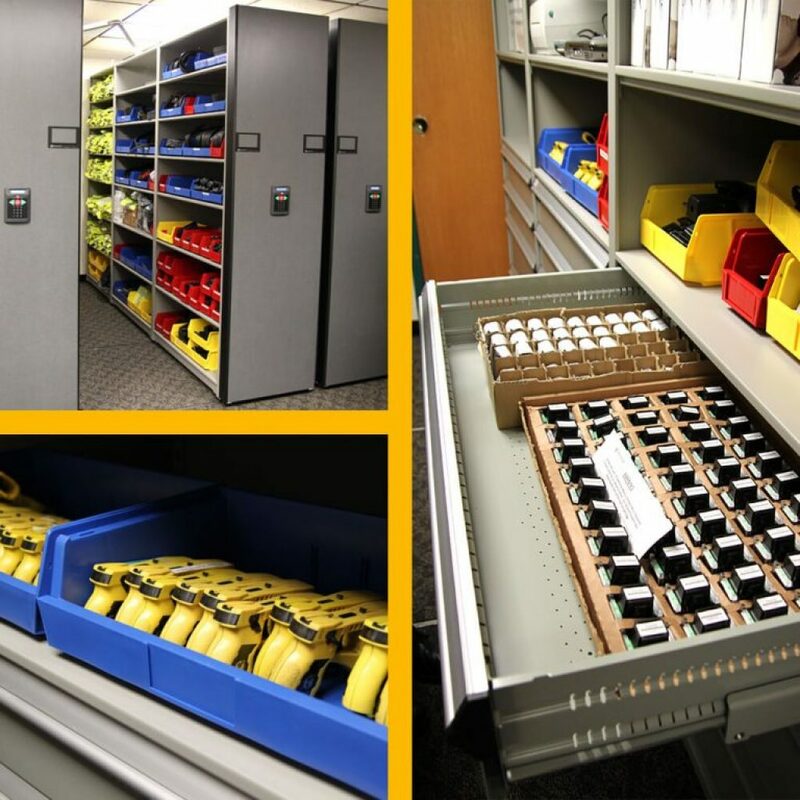 Shelves and locking drawers can be mounted onto a high density mobile storage system, which provides a great way to store all different types of gear – uniforms, duty bags, electronics, etc. in a smaller space. The mobile system can then be locked and accessed using a PIN code to provide a final layer of security. The easiest way to keep your spare handcuffs and cartridges organized and in one spot is to keep them in a locked drawer, but if you are planning a high density system or are really looking to step up your security, you can incorporate the drawer units into a high density mobile storage system. Tasers, cartridges and handcuffs can be kept in a mobile system. 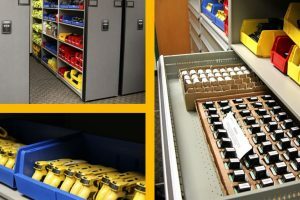 The locked drawers are alongside inventory of other issued gear and the aisles of the storage system slide together to keep items secure and make the most of the space. Aisles can only be accessed with a PIN code, providing an extra layer of security for the gear inside. Looking for a solution to store your badges, handcuffs, and extra taser cartridges securely? Talk to the specialists at Spacesaver Storage Solutions today.